Fall has set it, well... it's been so cold and rainy over the past week that it actually feels more like winter. Anyway, we are getting into the fall spirit and we carved pumpkins on Sunday. The pumpkins came from my parents garden so we couldn't let them go to waste. 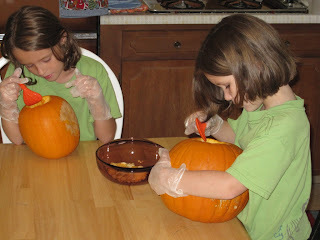 M is not a fan of sticking her hand in to scrape out the guts, but they both like doing the actual carving.